All microphones are not created equal. That statement is an overly obvious one to those of you who are in the filmmaking or videography game. However, not everyone knows it. There seems to be this highly outspoken rule that great audio is better than great video. In other words, if your video is mediocre, it doesn’t matter if your sound is great. And no matter how great your video is, if your audio is poor quality, then the whole thing is poor quality. It doesn’t seem fair does it? Well, it isn’t, but since people love great audio, there’s only one thing to do: Purchase great audio equipment for your videos. The problem with creating great audio is that it’s not cheap to do it. But anything worth doing is worth doing right, so save your money for better equipment. There are some exceptions to the more expensive equipment rule making a better audio product. 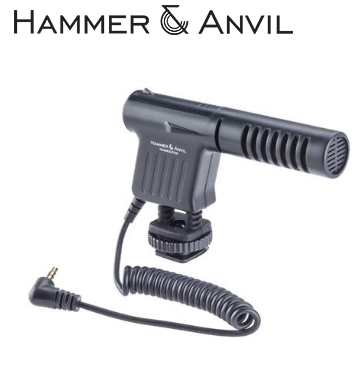 Hammer & Anvil products transcend that rule. In fact, I’d say that they break it. The HAAMKSLR100 (SLR100) microphone is one of those exceptions. Sure, you can spend more, but you won’t really get more. The SLR100 microphone is a directional condenser mike that delivers great audio for under $40. I like the SLR100. It’s small, compact, has its own power (AAA battery), has a pop screen, and a “dead kitten” for windy outdoor shooting. You can attach it to a hot or cold shoe or directly to a tripod mount. It also sports a shock mount of sorts on the base. It’s a complete video camera shotgun microphone that delivers very good sound for a small price. Now, you’re probably asking, “What are the practical applications for this microphone?” That’s a good question. If you’re a YouTuber who doesn’t want to be wired to a lavalier microphone or dish out hundreds of dollars for audio that’s imperceptibly better, then this is the mike for you. Would I use it for filming a documentary that’s going on Netflix? Probably not. 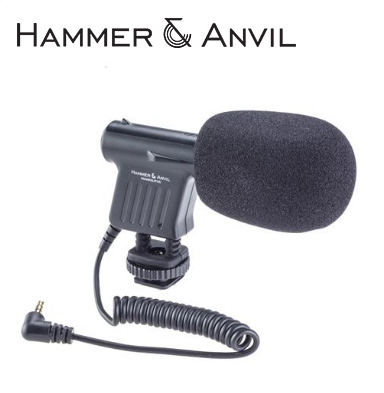 Not because it isn’t a great little microphone; it is, but Hammer & Anvil offers some very reasonably priced professional directional microphones for about $100 more and they’re just too tempting to resist. For example, I’m actually reviewing the HAAMKENG600 microphone as I’m writing this post. The HAAMKSLR100 microphone will do just about anything you want it to do and, as I pointed out in the review video, for a few dollars, you can buy a three pole to four pole converter and use this microphone on your iPad or on your iPhone as an external shotgun audio capture device. Awesome. It’s awesome because you don’t have to blow a lot of extra money buying a microphone specifically designed for your iDevices. You can use this one everywhere and that’s a very good thing. One of the things that I really love about the SLR100 is that when you turn on the mike, you can see clearly that it’s on because of the green light on the back near the ON/OFF switch. I’ve seen complaints on much higher priced microphones that don’t offer this basic feature. Bravo to the folks at Hammer & Anvil for providing that much needed feature. Why am I making such a big deal about the ON light, you ask? Well, after you run down a lot of batteries because you left your mike ON, you’ll understand why. The light clearly lets you know when the unit is ON and when it is OFF. To me, that feature alone is worth $40. I’m quite pleased with the sound quality that I get from the SLR100. It’s quiet where I need it to be and it picks up sounds that I want it to and all for the price of an afternoon matinee. I’m sold on it. As I said in the video, it’s a solid microphone and deserves the rating I give it. Adorama.com is a top-notch camera and accessory store for the amateur and the professional alike. This microphone is perfect for those who need something better than the built-in microphones on DSLRs, video cameras, and iDevices. Recommendation: Buy it for all your general video creation needs. It’s not a pro-grade microphone, but it’s darn nice for $40.